In my last two posts, I talked about the popular online learning and behavior management systems of Google Classroom and ClassDojo. In this post, I’m going to delve a little further into Learning Management Systems (LMS) for the K-12 education market. Whether you’re an online teacher with 1:1 students, or operate a network of schools, there’s likely a Learning Management System that will meet your faculty and student needs. Learning management systems (LMS) are software platforms for instructors to manage and organize educational courses online and provide students a single location for all course material. If you enroll in or plan to teach an online higher education class, it’s highly probable you’ll interact with an LMS platform. Some courses integrate online work and in-person courses. Others are fully online and rely on a mix of real-time and pre-recorded lectures, activities, and assessments. There are also free online courses with unlimited participation known as Massive Open Online Courses (MOOC); educational programs that rely on intermediary software for managing content and interactions for millions of participants. For those of us old enough to remember mail-in correspondence courses, welcome to the 21st century! Distance education was the driving force in the early development of LMS platforms with institutions like The Open University and NKI Distance Education Network. Blackboard Learn in the late 1990s and D2L (Desire to Learn) Brightspace in the early 2000s were early pioneers of e-learning platforms. In recent years, K-12 adoption of LMS platforms faces a unique set of challenges. School districts tend to embrace online education via in-person instruction with a combination of paper-based and digital work often referred to as a blended classroom. Unlike tertiary education, teachers, rather than administrators, are driving the adoption of digital tools and platforms. LMS-lite platforms such as Google Classroom, Schoology, Edmodo, and Quizlet have made significant inroads into primary classrooms with the important factors of cost, safe access, interoperability, and ease of use determining adoption. Below are brief descriptions and introductory videos for some of the bigger players. Many of the systems are free or offer a freemium business model for teachers and students to sign up and get started. For schools and school districts, integration can come with a hefty price tag. It’s also interesting to note that many of the more extensive reviews I found online were not from the education sector, but software and financial media, e.g., PC Magazine and Forbes Magazine. With e-learning expected to become a $325 billion dollar industry by 2025, we’re talking BIG business in education. Schoology Focus on K-12. Integrated with BrainPop, Google Drive, Khan Academy, YouTube, Nearpod, McGraw Hill, and many more. School administrators can request a demo for pricing for schools and district-wide LMS. Moodle Free, open-source software tool set to support both blended learning and 100% online courses. Moodle can be scaled to support the needs of both small classes and large organisations with extensive language support. Edmodo Part education LMS and part Facebook-style academic social media network, Edmodo gives K-12 teachers, students, and parents everything they need to transform traditional classes into blended learning environments. Blackboard Thanks to a vast product portfolio and a extensive list of partnerships, Blackboard Learn is a free, do-everything learning management system. Partners with many academic publishers. Absorb A popular LMS for employee training in medium to large businesses. Quizlet Simple to use and excellent for self-study. Free and paid versions. Offers a simple, user-centric online tool for rote learning that is particularly popular among language learners. Below are links to more LMS platforms, ratings, and reviews. 20 of the Most Popular LMS Solutions for small businesses and online education platforms from Finances Online. If you have experience on a particular platform, I’d love to hear your thoughts! Help a teacher out and leave a comment below. As always, best of luck in your classes! Sign up and download for free! 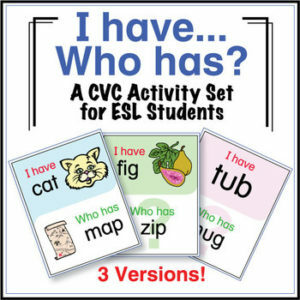 ESL Store Catalogue – Click to download! ESL Book Catalogue – Click to download!